I am a licensed counselor in Lakeland, Florida and my life's passion is helping people. I am honored to represent the counseling profession as a therapist, professor, and author. One of my specialties is working with children, adolescents, and adults diagnosed with neurodevelopmental disabilities. I also help families of all kinds overcome many types of challenges. I use many innovative types of therapy such as play, solution-focused, and cognitive therapies and I conduct groups with children and adolescents to help them understand themselves and learn to use their amazing gifts and find their place in the world. Kevin B. Hull, Ph.D. is a licensed counselor in the state of Florida. Kevin was born in Rochester, New York and moved to Florida with his parents who began working for Children’s Bible Mission in Lakeland, Florida when Kevin was nine. Later, Kevin’s parents worked as directors of Lighthouse Ministries, a homeless shelter in Lakeland that offers spiritually-based rehabilitation and teaches life skills to homeless men and women. Through watching his parents serve others through their work, Kevin became interested in finding a career where he could help others and make a positive difference in their lives. After graduating from high school, Kevin began working at the Florida Baptist Children’s Home in Lakeland, Florida and soon found his passion for counseling young children and teens who were struggling. The rest, as they say is history. After completing his undergraduate training in psychology at the University of South Florida, Kevin completed his Master’s degree and Ph.D.in Professional Counseling at Liberty University in Lynchburg, Virginia. Kevin worked for several years in community mental health centers around the Lakeland area with children, families, and adults in several different settings. He joined the private practice of Linda Compton, P.A. in 2000 after becoming licensed and began working with children, adolescents, families, couples, and individual adults in the private practice arena. Kevin became owner of Hull and Associates, P.A. in 2007 and specializes in play therapy with children and adolescents, as well as working with children, adolescents, and adults on the autism spectrum. Kevin was an adjunct professor for Webster University's Master's of Counseling Lakeland Campus for eight years and is currently an assistant professor for Liberty University’s Online Master’s program where he has taught since 2010. Kevin enjoys swimming, biking, golf, reading, playing the piano, writing, growing orchids and bonsai trees, watching sports, swimming, playing with his kids, and going on long walks on the beach with his wife Wendy. Play Therapy and Asperger's Syndrome: Helping Children and Adolescents Grow, Connect, and Heal Through the Art of Play (Jason Aronson Publishers, 2011) is for the mental health professional (psychologist, licensed counselor, licensed social worker) who utilizes play therapy and who works with children and adolescents diagnosed with Asperger's syndrome. This book is also for the graduate student learning effective therapy approaches to use with children and adolescents diagnosed with Asperger's syndrome (now known as Autism Spectrum Disorder). The book provides a history of Asperger's syndrome and the challenges that often arise in therapy with this population. The book examines therapist characteristics and skills necessary to effectively utilize play therapy with young people diagnosed with Asperger's syndrome. Play Therapy and Asperger's Syndrome presents the main therapeutic themes of children and adolescents diagnosed with Asperger's syndrome and play therapy techniques are provided for each theme to address the emotional, behavioral, and relational challenges. A separate chapter is devoted to issues of divorce and grief/loss and presents specific play therapy techniques to help children and adolescents diagnosed with Asperger's syndrome during these potentially tumultuous life events. Each chapter presents play therapy techniques to help build family connections and help parents/caregivers connect in a deeper understanding of their child or adolescent diagnosed with Asperger's syndrome. Bridge Building (Liberty Press, 2012) is designed to help parents of those on the Autism Spectrum build better connections and stronger relationships with their young people. It provides a helpful foundation for understanding high functioning Autism and offers parents easy steps to achieve closer relationships and better communication with their children - including ways to handle difficult situations like consequences and discipline. A must-have guidebook for all parents and guardians of those with Autism. Parents, and especially fathers, will greatly benefit from the insight, explanations and strategies in Kevin Hull’s new book, and improve their relationship with a son or daughter who has an Autism Spectrum Disorder. I endorse his approach, style and content and if you enjoy reading my books, you will enjoy reading this one. Dr. Hull’s first book, Play Therapy and Asperger’s Syndrome, opened a door for clinicians into a world of play filled possibilities in their treatment of these challenging youngsters. This new volume, borne of his “passion to help parents and caregivers” makes good its promise. Far more than a simple “how to” manual like many others, this volume is a compassionate, informative, and highly practical guide to helping parents and caregivers understand, appreciate, advocate for and engage with children, adolescents, and adults on the Autism Spectrum. Kevin Hull has written an easy to read, unusually engaging, and extremely useful and practical book for parents and teachers who live and work daily with the uniquely special and wonderful kids bearing this diagnostic label. Hull understands these youngsters and he is able to communicate in non-jargonistic language with parents who are often confused and baffled by the “out-of-the box” thinking and behaviors of these bright and interesting children and teens. The author offers “parent friendly” suggestions on how to connect, communicate, and discipline and to appreciate the strengths of these remarkable youth. This is a book full of hope and wisdom! Group Therapy Techniques with Children, Adolescents, and Adults on the Autism Spectrum (Jason Aronson Publishers, 2013) is designed for psychologists, counselors, and social workers who are interested in using group therapy with children, adolescents, and adults diagnosed with autism spectrum disorders. In this book, Kevin Hull demonstrates the therapeutic value of group therapy with the unique population diagnosed with autism spectrum disorder. Providing detailed case studies that present Hull’s group therapy techniques, the book covers four age groups: younger children, older children, adolescents, and adults, with techniques designed for each age range and ability. Sections for children and adolescents focus on the areas of emotional control and understanding of emotions, increasing perspective-taking, and increasing self-worth and self-awareness. The book presents bullying prevention techniques that provide children and adolescents with physical, emotional, and cognitive tools to overcome bullying. The section for adults focuses on increasing emotional understanding and perspective-taking, as well as relationship building and understanding personality. The book also provides guidance on how to help adults with problems of everyday living such as using community resources to assist with employment, transportation, and housing. Where There is Despair, Hope (Liberty Mountain Publishing, 2014) Nine-year-old Pierce Emerson has been left alone after the death of his mother. After being passed from foster home to foster home, he has come to the last stop: Boyd Home. Consumed with fear and anxiety, Pierce has withdrawn into himself. Cade Dalton, lead play therapist at Boyd Home, is no stranger to trauma, but as he tries to help Pierce he must face the darkness and pain that has overpowered the child and help to bring Pierce out of it. Author Kevin Hull tells a story of spiritual healing that demonstrates the mysterious process of how a shattered self is put back together through the power of loving relationships. While in graduate school, I read a book by Virginia Axline, the superb play therapist called Dibs: In Search of Self (Random House, 1964). The book's impact on me was profound. I was also influenced by the work and writing of Dr. Oliver Sacks, whose book Awakenings (Random House, 1973) demonstrated his artistic ability to communicate scientific information within the context of a story. As I witnessed miracle after miracle in the therapeutic realm of play and relationship, I was struck by the idea of writing a novel to show the power of a therapeutic alliance and the healing nature of play. It is my desire that anyone who reads this will be witness to the mysterious yet simple act of joining a child in play and affirming their creative passions. Play Therapy: A Comprehensive Guide to Theory and Practice (Guilford Press, 2015) is a powerful collection of techniques and strategies. My chapter Play Therapy with Children on the Autism Spectrum discusses innovative techniques and strategies for working with this dynamic and unique population. The 2nd Edition of Charles Schaefer's landmark text, The Handbook of Play Therapy (John Wiley and Sons Publishers, 2015) takes the elements of the classic text with a fresh application of today's issues and therapeutic demands. My chapter Technology in the Playroom discusses exciting ways for therapists to use tablets, computer/video games, and other technological advances to add extra dimensions that make play therapy innovative, effective, and fun. Handbook of Child and Adolescent Group Therapy (Craig Haen and Seth Aronson, Eds. - Routledge Publishers, 2017). My chapter Children and Adolescents with Autism Spectrum Disorders discusses strategies and techniques with young people who struggle with autism and how group therapy can be of great benefit to them. 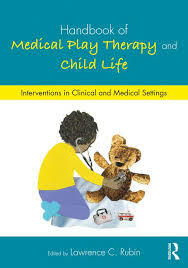 Handbook of Medical Play Therapy and Child Life (Larry Rubin, Ed. - Routledge Publishers, 2018). My chapter Play Therapy with Children with ASD and Chronic Illness explores effective play therapy techniques to help children diagnosed with Autism Spectrum Disorder (ASD) overcome medical issues that often accompany ASD. Two powerful case studies are used to demonstrate techniques of play for this demographic of children that are often difficult to reach with traditional therapy approaches. My idea for my dissertation was born out of watching a young man with severe emotional problems play a simple Mario Brothers game on an original Nintendo Game Boy. This young man could not tolerate any type of frustration and was often angry. Nearly every day at home and at school he would lash out at others and often broke things. I noticed that when playing the video game he showed remarkable emotional control, even when he failed. In fact, not only did he try again without reacting, but he learned from the failure and made better choices and soon completed the level of the game, and went on to the next. I used this experience with him to help him learn frustration tolerance which expanded to other situations. The metaphors embedded in the game such as overcoming obstacles, avoiding enemies, and using resources like asking a teacher for help or telling his mom how he was feeling helped him gain emotional control and feel better about himself.